Happy Easter Week everyone!! 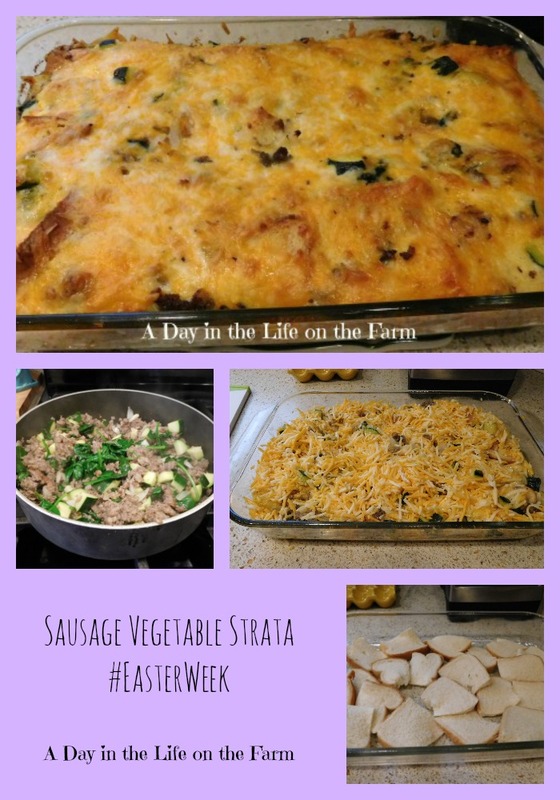 Christie of A Kitchen Hoor's Adventures asked the members of Holiday Fun with our Blog Friends, to share some Easter Dinner and/or Brunch recipes with our readers. You will find great recipes being shared each and every day this week. This gives you plenty of time to figure out your menu. In fact, there are so many recipes that you could also figure out your menu for your Mother's Day Brunch. Do you celebrate Easter in your household? Do you cook a fabulous feast-like dinner or do you create a fancy brunch to celebrate? This week, I will be sharing a little bit of both with you. Easter is big in my household. It is the most important feast day that we celebrate in our church. We spend Lent fasting and abstaining in remembrance of the sufferings that our Lord took upon himself. We have a feet washing service on Holy Thursday, a solemn, mournful service on Good Friday, a Joyful Vigil Mass on Holy Saturday and a Celebratory Easter Mass on Sunday. It is a very busy time and planning is crucial if I want to have the family gather around the table for brunch or dinner. That's one of the reasons that I was so pleased that Christie came up with this idea. I know that all of you are just as busy, time constrained and stressed as I during the holidays. When I was an officer on patrol, working the afternoon shift, we always had an Easter Brunch. I could spend time with my family and enjoy a great meal before heading off to protect and serve. When I got an inside position working days with weekends off, I began having both an early brunch and a late dinner so that all of the family could be there at some time or another during the day. That, my friends, was a lot of work. 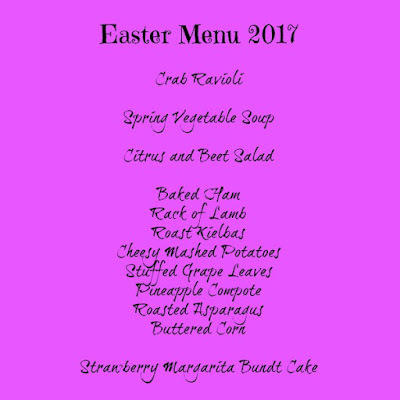 It only lasted a couple of years before I started celebrating Easter with the family by having a early dinner, around 4-5 pm. So while, I am having dinner this year the first recipe that I am sharing for this week long celebration is a brunch dish. We may not be having brunch this year for Easter but we do have brunch quite often. I like to get my kids over a couple of times a month for dinner on the weekends. Some months life gets in the way and dinner is not a possibility but they are available to come over for a brunch before their other plans. 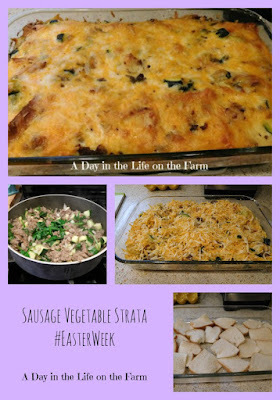 I love making stratas for brunch because they are made the day before and then need only be popped into the oven an hour and a half before you are going to serve. Treat a 9x13" baking pan with cooking spray. Place the bread pieces on the bottom, overlapping as necessary. Cook the sausage in a skillet over medium heat, breaking into bits until no longer pink. Drain any grease from the skillet, retaining sausage. Add the spinach, zucchini and onion to the skillet and cook, stirring for another 5 minutes or so, until veggies are crisp-tender. Layer onto the bread in the baking pan. Whisk together the eggs and milk with the salt and pepper. Pour over the layers in the baking pan. Sprinkle the cheese over all. Cover and refrigerate overnight. Wow! what a spectacular menu. 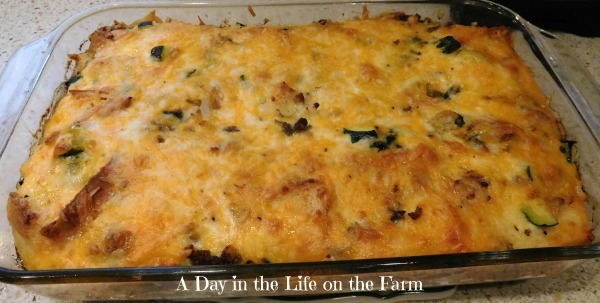 Love brunch, my favorite and this strata looks delicious! I'm not sure what we are doing for Easter this year. It just seems our family is so scattered. Paige will be going to her great-aunts so I don't know if Justin will come. Maybe just Harley and me here!! 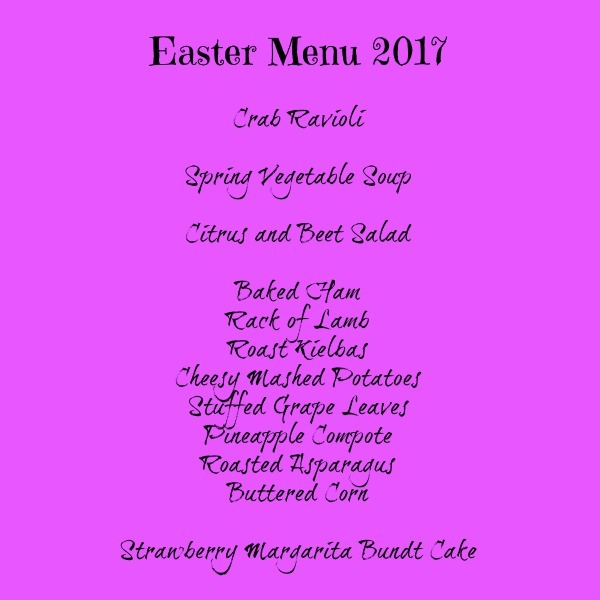 Your menu looks amazing, as usual! Well whatever you do, Paula, I hope your day is a joyful one. Sadly, this will be the first Easter my husband and I am spending by ourselves. Both our married sons are going to their inlaws for Easter, and our youngest son unhappily has to work. It was bound to happen, but we will dearly miss our grandchildren. So, dear hubs and I will probably have a quiet day of reflection and simple meals, enjoying the day that God gave us. 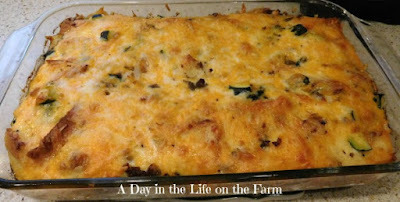 Thanks for the recipe - I always love breakfast casseroles that can be made ahead! Empty nest syndrome is real!! I feel for you, only 2 of our 5 children will be joining us this year. 2 have to work and the third lives out of State. I hope that your Easter is pleasant none the less. Perhaps the following weekend you can have the whole family for brunch. That menu sounds absolutely amazing! And I love a good strata. What a great way to get the day kicked off right! Oh, my goodness! I am so jealous. Your menu looks fabulous, Wendy. Rack of Lamb is a family favorite, but I decided to do rabbit this year. I seldom make lamb because Frank doesn't care for it so only when it is a second or third meat can I have it here at home.